The San Jose Fire Department is well trained when it comes to responding to a nuclear or biological attacks. It routinely plans exercises. But when it comes to active shooter training, no one is as prepared as they would like to be to save lives when a gunman is still on the loose. In such a scenario, firefighters from the Santa Clara County Fire Department go in with police wearing bulletproof vests and protective helmets to treat victims and pull them to safety. The assumption going in is the shooter has not been caught. Kerry Harris is a former SWAT team leader who now runs a nonprofit where his team trains schools and businesses on how to deal with active shooter scenarios. "It's really important," Harris said. "So many active shooter situations, and we know we need to get immediate medical care to those people who are suffering a traumatic injury." 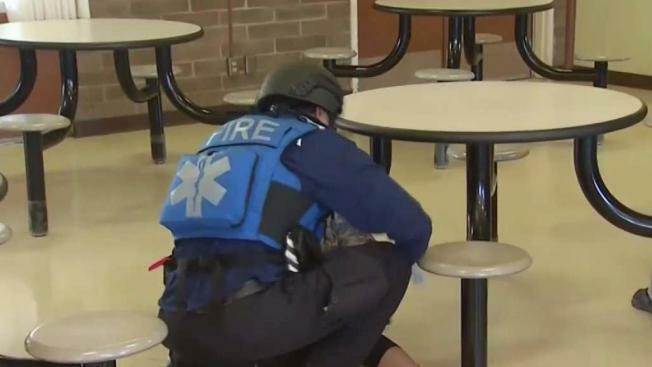 During an active shooter response, police create a so-called warm zone, an area they've deemed temporarily safe for trained firefighters to go in while other officers look for the shooter. "We need to get them in there quickly," Harris said. During the mass shooting at Columbine High School in Colorado, many victims bled to death because firefighters and paramedics couldn't get to them until the campus was deemed secure. That was three hours after the incident began. With the rise in such active shooter incidents, many fire departments started training their crews for early entry into danger zones. But San Jose is not quite ready. Acting Fire Chief Robert Sapien Jr. says a final draft of the policy is in the works, and he hopes to begin training by the end of the fall. "Right now, we're not prepared to go live with that policy," Sapien said. "Building those capabilities with a fire department the size of San Jose is not an overnight operation. It's usually a one- to two-year evolution." San Francisco and Oakland fire departments said they've conducted active shooter training. In Oakland, it started after the Oikos University mass shooting that left seven people dead.